Get Involved in the World’s Largest Shoreline Cleanup on September 19! The Alliance for the Great Lakes and the Ocean Conservancy invite you to join hundreds of thousands of volunteers worldwide in cleaning up beaches and shorelines on Saturday, September 19, during the 2015 Adopt-a-Beach™ event held in Michigan and other Great Lakes states. The annual Adopt-a-Beach™ event is part of the International Coastal Cleanup organized by the Ocean Conservancy. In last year’s clean-up, Michigan volunteers put in 11,304 hours and removed 9,207 pounds of trash. The Office of the Great Lakes, Coastal Zone Management Program is a long-time supporter of Michigan’s annual Adopt-a-Beach™ event, and we would love to see more volunteers removing more trash from our coasts in 2015. Walking the beach, enjoying the camaraderie of fellow volunteers, and leaving the shoreline cleaner than you found it are some of the perks of pitching in on the clean-up event. Another important benefit is that the trash collected is tallied, and the resulting data on the types and quantities of trash items feed into research projects aiming to identify the origins of the trash and ways to curb it. 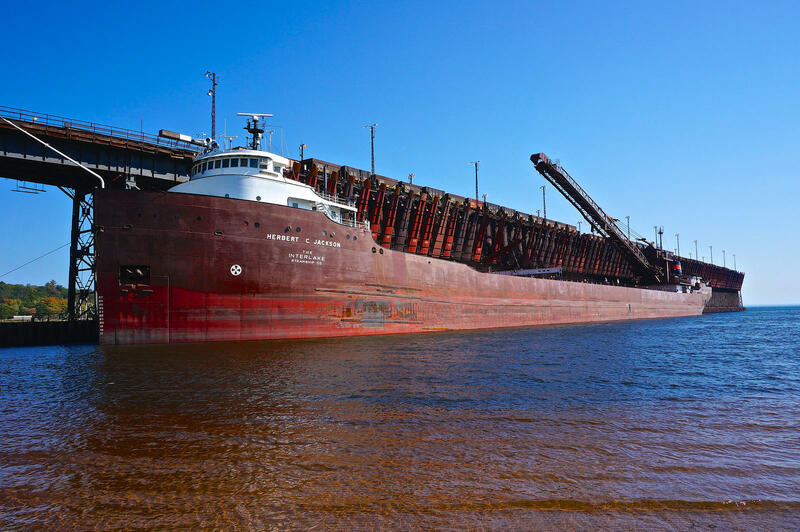 “And in fact, during the American Civil War, the bulk of the iron ore used by the Union Army came out of the city of Marquette,” said Stonehouse. The ore dock near Presque Isle State Park is owned and operated by Cliffs Natural Resources. It’s 1,250 feet long, 60 feet wide and 75 feet above water. The ore dock has 200 pockets and can store 50,000 tons of iron ore pellets with an annual capacity of 9.5 million tons. The University of Wisconsin Sea Grant Institute’s R/V Dawn Treader is mostly full of scuba-diving equipment with two maritime archeologists and three volunteer divers from Madison squished in between. 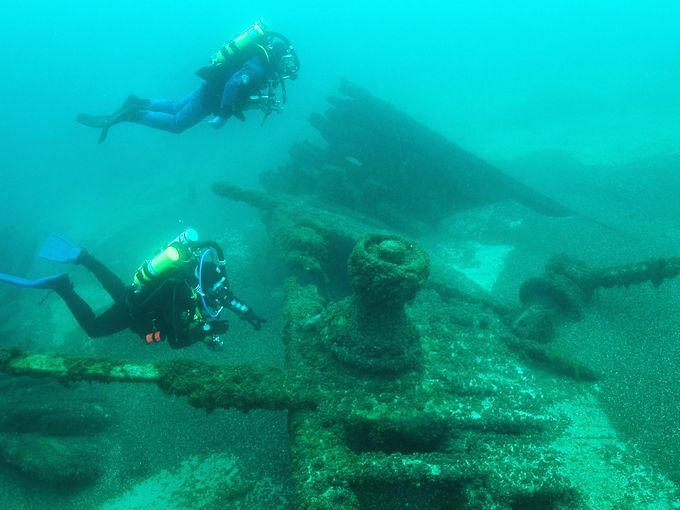 They came to Manitowoc County to survey the S.C. Baldwin shipwreck, a requirement to add the vessel to the state, and eventually national, Register of Historic Places. 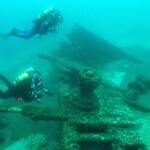 “(Shipwrecks) are literal time capsules, a snapshot of what was going on at that specific moment in time,” volunteer diver Matt Schultz said. Built in 1871, the Baldwin is believed to be the first double-decker steamer on the Great Lakes and carried iron ore from Escanaba, Michigan, to Milwaukee. It was later converted into a barge hauling coal, lumber and eventually stone. The 160-foot-long vessel unknowingly left on its final voyage in 1908. 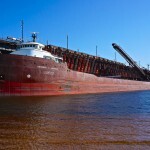 Carrying 693 tons of stone, the barge was hit by strong winds and waves, according to the Wisconsin Historical Society. Nearing Kewaunee about midnight, the Baldwin sprung a leak and “turned turtle” at about 2:30 a.m. near Rawley Point lighthouse.